Well, at EverythingRecording HQ, we’ve got Scarlett fever. Yes… it may sound like an obvious joke but actually, it’s the truth. We love these two units. Our initial post last year got so much traffic and activity that we couldn’t pass up the opportunity to test drive these two gorgeous USB intefaces. We all know Focusrite. Their legendary Forte console and Red Compressors are two of many heavy hitters in their lineup. My first pre-amp was an ISA and I still use at least once somewhere in every session. The bloodline is not lost in their mobile line of USB interfaces. You get a sleek brushed aluminum crimson chassis with a very straight-forward front panel. Each channel has an LED halo that lights up green when signal is introduced, orange to warn you of clipping, which then in turn goes red. Each button also lights up red when engaged, making it easy to know when certain features are up and running. Each have 2 channels of pristine, clear, transparent goodness taken from the Liquid Sapphire 56 Interface with 24bit 96kHz. You will be hard pressed to find an interface in this price range or even some above, with the quality pre-amps you get in these two series. You get a decent deal of headroom, even giving your ribbon mics enough juice. So what do these two units have in common? Well, you get two channels of the same pre-amp with a Neutrik combo jack on the front; giving you the option to either plug in direct with TRS, Quarter Inch, or XLR cable. You get the ring around the gain knob to monitor input levels, Phantom power, front jack for headphones and big knob for the monitor mix. You also get Focusrite’s Scarlett Plug-in bundle that features a Gate, Compressor, EQ, and Reverb as well as a lite version of Ableton. Basically you get everything to get you started. If all of this is enough for you, then the 2i2 is perfect for you. Coming in at $149.00, you can’t beat the price for quality. It’s also slightly smaller than the 2i4, so throwing it in your laptop bag is no hassle at all. Latency isn’t much of a hassle either. In most cases, your DAW’s settings will pose more of an issue than the interface, making Scarlett great for any program. I personally used Pro Tools 9 for the review and it played nice. I especially liked the direct monitoring switch, which gives you the direct signal off of the interface instead of through the DAW. All in all, the 2i2 fared well in the scheme of things. But what if you had an extra $50 laying around? What more do you think you could get? The answer may surprise you. 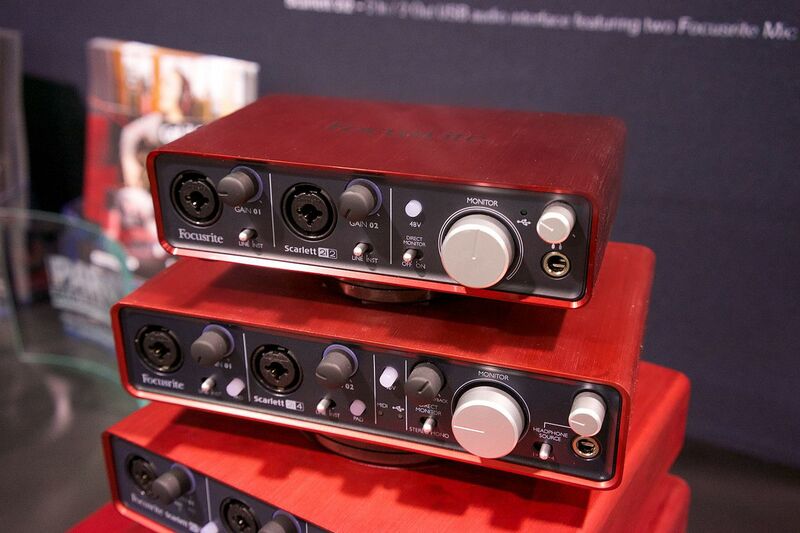 Enter the Scarlett 2i4… Same red chassis, same great preamps, but slightly bigger in size. You get everything the 2i2 has but with a few added key features. Instead of just having the headphone and main monitor out, you get two more unbalanced RCA outputs; perfect for running outs into a PA Mixer or a DJ rig. This is perfect for live and studio performers alike. You get a pad on each of the pres, perfect for running in a stereo bus of drums or any high SPL source. Another great addition is the Stereo / Mono switch. Say you have a stereo in from a keyboard or just 2 mics on an acoustic guitar and you want to monitor it in stereo. Switching to stereo will place channel 1 on the left and channel 2 on the right, giving you a nice stereo feel in the monitors or headphones during tracking. Instead of giving you a direct monitor switch, Focusrite upped the ante by giving you a knob to blend between the direct out and the out coming from the DAW. You headphone source is also given more power by allowing you to either leave the headphone volume to the headphone port OR switch to one of the RCA outs, allowing volume control to your DJ rig or Mixer. What more could you want? How about midi ports on the back, saving you a USB port on the computer for one of your million USB license keys. And to add icing to the MIDI cake, Focusrite gives you Novation’s Bass Station and Loopmasters content. All of that for $50 more bucks. The software alone makes up for that. The choice is pretty easy if you ask us. So is there any catch? Well sorta. My main gripe is the lack of volume. I found myself trying to peg out the headphone output and ending up disappointed. I had to jack the master fader in my DAW considerably to get the necessary volume needed to get the creative juices flowing. In turn that causes you to track hotter, which messes with using dynamics control and instruments fighting to find a space in the mix. Adding the volume in the master fader still doesn’t help in tracking. If anything, it makes playback louder, causing you to have to dial in the direct audio knob. It’s not a dealbreaker per say, given the price, but it is an inconvenience that could be fixed with a good set of powered monitors or a headphone amp. I kept finding myself trying to equate it to the Propellerhead Balance unit I reviewed before and in ways, it kept falling short. I know the Scarlett is in a different price range but Balance just seemed to set the bar for USB Interfaces. Another issue wasn’t necessarily an issue for me but might cause an issue with someone without recording software. I know Ableton has it’s place in the remix and electronic world, but I just wish they would’ve included a better DAW, or at least a full version of Ableton. If you already have a DAW, a headphone amp, and good set of speakers, you’re in the money! Even if you don’t, the units are collectively $149 and $199, so getting extras is worth having incredible pre-amps, beautiful chassis, and intuitive front panel. Overall value for money, you can’t get another interface that comes standard with pre-amps that even sound remotely as pristine and full as these two beauties for the price. I wish when I started out recording, I had an interface that sounded half as great as this one does. The bar has definitely been raised for portable inexpensive interfaces.